The fun of seeing Jared Franklin and Peter Bash in Franklin & Bash is the interplay between two men who genuinely love each other but are far too manly (or immature, take your pick) to ever actually say it to each other. If anything, Franklin & Bash has always been the celebration of the bromance. You have two guys who in their own ways never fully grew up but who have the resources to indulge their antics all while getting paid for it. The first season (or what I can remember of it) had offbeat cases while these two fought the stuffy Establishment (personified by Reed Diamond's Damien Karp) with their own zany irreverence. The second season, frankly, was about two dim-witted jerks who continuously got lucky (in every sense of the phrase). Franklin & Bash Season Two took our boys off in a bad direction. It made them dumber, more self-absorbed, and wouldn't allow them to grow up or mature. Rather than introduce a balance between being unorthodox but brilliant, Franklin & Bash took the route of least resistance. What could have been a great season of the struggle between being true to themselves while accepting that they can't be fratboys forever instead decided to be all about how they get away with things even when they wouldn't in a sane world. Jared Franklin and Peter Bash might be goofballs, but they also were brilliant attorneys who found joy in fighting for the little guy. This season would have done well to focus on the conflict between their new, posher surroundings and their basic core principles of doing good. Instead, case after case had them appearing almost unaware of how the law genuinely worked. More often than not they appeared to be idiots, stumbling into things rather than finding their way to success. Worse, on a couple of occasions (Summer Girls and Last Dance) it was Hanna (Garcelle Beauvais), their frenemy, who did the heavy lifting while Jared and Peter seemed more interested in giggling like schoolboys at the pretty girls all around them. Looking over the episodes in Season Two of Franklin & Bash, I was quite surprised to find that out of ten, only three scored higher than an average 5, and three had just a five. While that at first appears to make this season a mild success, we have to content with four episodes that were really awful in terms of story, of performances, and of character development (or lack thereof). First, a bit of Tabulation. It should be noted that the worst episode of Franklin & Bash followed the best episode, and that about sums up how off-balanced the series has been this year. I think it comes from a mistake by co-creators Kevin Falls and Bill Chais. I think they believe that the reason Franklin & Bash is so popular is because people like seeing two stupid leads, where we celebrate how their 'man-child' routine gets them out of trouble and into pretty girls' beds. However, this isn't the show I fell in love with. The Franklin and Bash I remembered were fun-loving, but again they were smart. They also had genuine emotions to them: Peter was nursing his heartache over his lost love affair with Assistant District Attorney Janie Ross (Claire Coffee), while Jared was working to get himself as far away from his father, legendary attorney Leonard Franklin (Beau Bridges) as possible both physically and emotionally. Those threads, interwoven with the bizarre legal cases they had and the joy they got out of teasing and taunting their Number One Nemesis, Stanton Infeld partner Damien Karp (Reed Diamond) was what made me enjoy Season One. With Season Two, we lost a key component: the emotional aspect. While Ross reappeared in Peter's life, she just was in two episodes (Viper and L'Affair Du Couer), where after one fling in her office she just...disappeared. The story arc of Peter and Janie was a major component of Season One, but in Season Two she was just another notch on his belt. Faring even worse was Peter's next love, Officer Wendy Cowell (Kat Foster). She was in the opening episode Strange Brew, where despite her sense she fell for Peter's smooth charm and hot bod. We next see her in the following story of Viper. Anyone watching might have thought she was going to play a major role in Season Two, and perhaps give Peter a conflict between his new and old love. Instead, Officer Cowell all but vanishes with nary a trace. Where'd she go? Why did they break up? DID they break up? 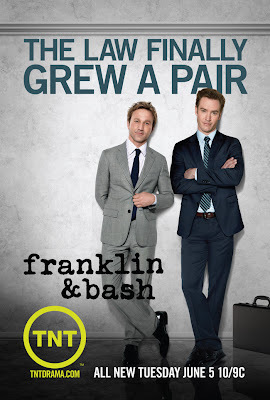 Again and again Franklin & Bash Season Two introduces things merely to drop them. Janie comes and goes, Officer Cowell comes and goes, the secret file Hanna and Karp is mentioned in Strange Brew and brought up again in either Summer Girls or Last Dance (I can't recall) when Hanna deletes it. It does rear its head one last time in 6:50 to SLC, but I would have found it nice to see Hanna and Karp actually keep tabs on Franklin & Bash's antics. It does seem so unlike the careful, plotting Karp to leave everything up to Hanna. That I think is another major flaw in Franklin & Bash Season Two: the characters are no longer realistic. Yes, I'm fully aware that by and large none of these people could be described as 'normal', but even within the oddball world that is Franklin & Bash there has to be some consistency. Take Damien Karp for example (a character I'm starting to sympathize with). For most of the season Karp had two goals: keep to his own high standards (while at times struggling whenever he found a woman he was attracted to) and get rid of Jared and Peter. All well and good, until we get to Last Dance. Here, the steady, methodical Karp basically goes insane: going after a suspected stalker of his uncle Stanton Infeld (Malcolm McDowell), getting flustered at how he can't rattle someone he thinks is not at his level. What makes this such a weird turn is that nothing suggests Karp would go so far off the deep end. Damien Karp, at least the one I've known these past two seasons, would have gone to Carmen FIRST to see IF the guy really was putting Infeld in danger and work from there. He wouldn't just almost pick him at random and then both subtlety threaten him and have goons sent over to threaten him. It was so irrational and out-of-character. I just felt it was done to give Diamond a chance for some Franklin & Bash-style hijinks, but which fell flat. Having unlikable leads doesn't help. Worse is Breckin Meyer's Jared (whose real name we learn, is Elmo...something that is mentioned once and not commented on again). He's such a jerk to everyone he meets (even to his best friend Peter) to where one wonders why Peter would want to stay with him or how he managed a girlfriend in Shiri Appleby's Emily Adams. Let's look over him (and again, that isn't a short joke): he skips meetings (and makes Peter miss them too) to finish his breakfast, he constantly mocks Peter for all sorts of things (temporarily losing his law licence, being afraid of heights), he goes into cases apparently unprepared or at times even aware how trials (or in both For Those About to Rock and Summer Girls, judges and court-martials) operate. If Waiting on a Friend is to be believed, Jared all but bullied a highly reluctant Peter to participate in a courtroom stunt that began what was to become their trademark style of gonzo trial behavior. Therefore, how am I suppose to cheer on someone as loathsome as Elmo "Jared" Franklin, Daddy Issues Be Damned. If all that isn't enough, the plot points and characters being discarded or shifted badly, we have two characters who are now dumber than they began. I wondered if either of them had ever bothered to see an episode of JAG (actually, a line or a scene suggesting they were preparing for their case thus in Summer Girls might have actually been funny). If they had, the shock they had when they discovered that in the military, you don't need warrants to search troop's property might not have been there. Throughout Season Two Jared and Peter just came off as idiots, unaware of basic history (one didn't know Franklin Roosevelt had polio) and who allowed their overinflated sense of self cloud their judgment. In Voir Dire, they kept dismissing potential juror upon potential juror because they wanted a certain jury type but not wondering about the prosecution lack of jury dismissal until it was almost too late. Personally, I would have liked to have seen them humbled a bit by losing a case, to show that they aren't the geniuses they imagine to be (with very little in evidence to support that). My frustration began with Strange Brew, when we were achingly close to seeing them take adult responsibilities for their actions, one that might have had ramifications for the future. Instead, they were provided an easy way out of their predicament which allowed them to not grow up (or grow a pair, to coin a phrase). Again and again, I was astonished at how they would get themselves into a mess only to find someone else would get them out. All I kept thinking is, 'They'll never learn if they keep getting bailed out of things'. To sum up my Closing Arguments, I loved what I remember of Season One of Franklin & Bash. They were totally lawyers: best friends, goofy, charming, but with emotional situations that they either weren't willing or able to handle well. The struggle between the hijinks of their clients, their associates Carmen (Dana Davis) and Pindar (Kumail Nanjiani), and between growing up mentally/emotionally while still having a good time was what kept me watching. Season Two of Franklin & Bash, conversely, showcased two dimwits who had nothing to offer but ego and fortuitous accidents that gets them out of trouble. I liked Season One Jared and Peter. I dislike Season Two Peter and hate Season Two Jared. For Season Three, I can only hope that we get more grounded characterizations, where Jared and Peter start showing that they are capable, not lucky, and that the cases, while still odd, at least are resolved through their own efforts, not through something or someone coming in to be their Deus Ex Machina. Boys, you and I deserve better than Franklin & Bash Season Two.